Top sportsbook players are racing to find the perfect last minute bet to make on Saturday’s NCAA wagering lineup. This weekend will represent week 2 of the 2017 FBS season and there’s no question that the day’s results will play a hand in determining the playoff landscape. So what are some of the better lines that fans can take up this Saturday? No. 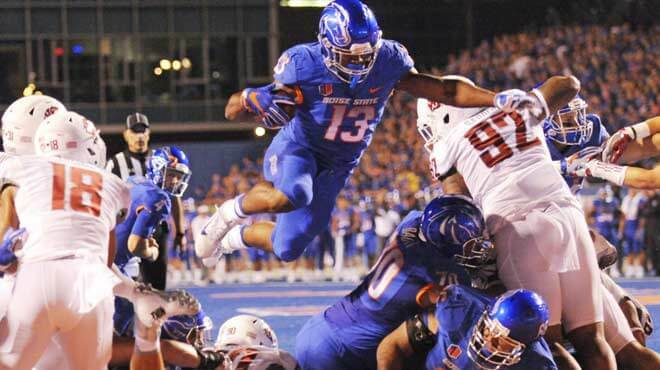 20 Washington State will be hosting the Boise State Broncos late Saturday night and the odds available are certainly worth taking a shot at. Oftentimes when betting on NCAA football last minute fans will take the higher ranked team over the lower ranking one out of instinct. If that’s the case, then the Broncos would be your betting option this Saturday night. The Cougars will have home field advantage against their unranked opponent this Saturday. Yet another reason for the best online sportsbooks to come out in favor of Washington State in a decisive manner. Despite this, both teams come into this Week 2 matchup with an unblemished 1-0 record. However, one of their 0’s has got to go. The below-listed odds hail from GT Bets sportsbook, one of the newer bookmakers on the web that is revolutionizing what it means to be a leader in the industry. GT Bets has plenty of premium sign up bonuses to convince players to make a move, as well as great reload bonuses to keep players enticed as the season goes on. Take a look at the action they’ve put together for Saturday night’s game and feel free to read up on their sportsbook review. Washington State comes into this game as the top sportsbook favorite. Which is only natural, considering they’re facing an unranked opponent. Washington State opened up their 2017 season by facing the Montana State Bobcats. The Cougars came into that contest as the heavy betting favorite as well and they didn’t even break a sweat as they cruised past the Bobcats 31-0. Washington State managed to find the end zone once each quarter, and outgained their opponent 511-143 in total yards. The Cougars will be vying for a similar performance tonight. Boise State also opened up their season with a win, albeit not as dominant as Washington State’s. The Broncos faced the Troy Trojans and defeated them 24-13. Boise State finished the day with 210 yards but did suffer 2 turnovers. The Trojans would go on to finish with 139 yards on the day and had 3 turnovers of their own. Best Online Sportsbook Bets to Make: Online sportsbooks have come out heavily for Washington State, so a small bet on the Broncos could yield a big payday. The 10-point total prediction seems a bit too large to gamble on, so betters might want to stick to the totals on this one.